From the sanctity of the woods we return to the busiest week of our year, amidst all the Christmas hustle and bustle longing for the simplicity of the trail again, in spite of frigid temperatures outside. As winter's chill descended we felt mixed emotions about leaving our warm home, though emotion often prevails over reason. Somehow I sold Coleen that the best approach to winter camping was a single overnight nearby, where the kinks could be worked out without major risk. Within a few days, a forecast of new snow in Shenandoah provided just such an opportunity. It's a clear day with small clouds beginning to dot the sky as we pull up to the ranger station - our request for a back-country camping permit is met with a barrage of onerous regulations. So, with fingers crossed, we promise to abide by the rules, and head to Panorama for parking. We're on the road at 2:10, walking south on Skyline Drive for our hitching attempt. Our third try is a winner, a pickup offering a ride in the bed - great fortune to have a ride barely 5 minutes after our first attempt. We have to reconsider this as he roars southbound, sliding on the occasional ice patches - it sure looks fast from our reverse view. It's a race to see if our discomfort with riding the serpentine road backwards, or the cold will force us to cry "Uncle! ", but suddenly the meadow appears, and we pull into the visitor's center. After the usual pleasantries with our driver (an AT section-hiker himself), we're off, stopping first at the local port-a-potty. We're nearly petrified from the cold of the truck ride, and the port-a-potty isn't any warmer, so we quickly get away. 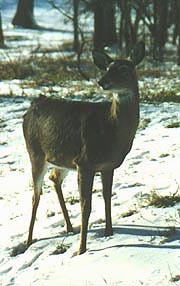 Before even reaching the AT we see our first deer, a doe who ignores us, sauntering slowly into the edge of the woods to join her companions as we approach. My old pair of walking shoes have no traction at all, and any downhill grade turns me into a Keystone Cops rendition, especially when the snow covers a layer of fallen leaves. Before long I take a spectacular fall, although my pack makes a great cushion for rearward falls. The surface is an odd mix of these slippery patches and others where a thin crust has frozen an inch or so above the solid ground, making walking difficult as each step breaks through and our hiking poles stick between the two layers. Still, we make good time on the level grade, the workload low enough that we barely warm up. Soon the sky grays and the snowfall begins, increasing to a hearty rate, though it's cold enough not to stick to our clothes, and actually makes for pleasant walking. The passage of more deer bedded down motionless to one side of the trail reminds us we're not alone, and we're startled a few times flushing out the occasional grouse. At the Hawksbill parking lot we've anticipated camping at the day shelter atop the mountain, but seeing some convincing signs prohibiting camping there, we drive on to find a spot to tent (warmer anyway). Skyline Drive diverges to the east, and a flat area above us to our right might well be out of sight both from road and trail. We climb up to find a level plot with just enough room for our tent, so in the fading light we set up, piling what leaves we can find under the tent for a cushion (the ground's hard frozen, so this may aid our comfort). We contemplate a fire, but Coleen would rather settle into the tent, which we do, cooking dinner as we recline within our tent (a safety taboo that's becoming a little too common for us - but then, the bears should be hibernating). After dinner we have hot chocolate, and Coleen settles into her sleeping bag for warmth. I fly the food bag just high enough to keep the smaller critters out (it's now a beautiful night, full of stars, with the lights of Luray VA shining from the valley below), and settle back inside to my journal until our candle dies. We're both in bed at an early 8:15, although far from sleep, as the howling wind continues to increase in intensity. Coleen is cold, and tries my sleeping bag briefly, finding hers better, so we switch bags a second time. I'm pretty toasty save my toes, which take an hour or so to warm up (a few snores tell me Coleen's getting some sleep). The wind shakes the trees above mercilessly, reaching its peak somewhere around 01:00, after which I catch only the occasional nap. "Cold clear mountain streams are plentiful with native brook trout and other aquatic life. Waterfalls leap over ledges of ancient rock. A black bear and her cubs amble across a narrow wilderness trail turning over rocks in search of insects living underneath. The stars on a clear Shenandoah night are brighter without the competing glow of city lights. The only sound is that of a light wind through the trees, occasionally broken by the call of one of the many species of birds." Let me correct this quote slightly for the season. The streams are frozen solid, as are any brook trout therein - the only aquatic life alive is the giardia parasite, ready to send us scurrying for the locked-up privies should we drink it without passing it through our frozen filter. The leaping waterfalls are also frozen. The black bear and her cubs are hibernating, and couldn't turn over rocks anyway, as the ground is frozen. Between snow showers, the stars are as advertised, although we can only stand momentary glimpses before scurrying back into our tent for warmth. And that "light wind through the trees" - by far the most gargantuan lie presented. Nothing light about it - it's a full-fledged gale. Think freight trains, think jackhammers, think squadrons of jets soaring across at low altitude and you'll have a pretty good idea. Our small tent is lifted by the edges with each gust, but our weight is more than equal to the challenge, and the poles somehow keep it erect. I'm up at first light, getting Coleen up soon after, finding it windy and bitterly cold out, though cloudless; and the sun already paints a beautiful orange glow on the eastern horizon. Coleen's bound to the ground until I make her coffee and cream of wheat in bed, finally persuading her to get up quickly, as we won't be any warmer than now. We hurriedly pack within the tent, not opening the flap to the roaring wind until all is ready. We're of at 08:09, having to backtrack a bit, as we now see that our campsite was perched atop a sheer 100' cliff. The walk is dominated by frozen waterfalls of majestic size, and the sun soon hits the ridge crest, the cliff to our right minimizing the strong wind. Climbing Stony Man Mt, we catch the sun's rays as the wind turns southerly and diminishes � both good omens. Soon we're fairly comfortable, and can enjoy more of the stunning vistas of Shennandoah Valley to our west. We quickly pass Skyland, closed for winter, so we find a convenient log just past for a quick break (all our breaks are pretty quick at this temperature). Gnawing on a frozen Snickers bar I chip a molar in two, leaving me to worry about getting dental care on our return. 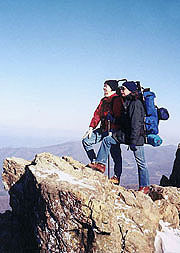 Hiking Shenandoah, it's obvious why many hikers put in high-mileage days here � it's such easy hiking. Hiker opinion of the park is mixed - many are angered by the cutting of acres of trees around each road overlook to preserve its view � a mighty hypocrisy from the agency that insists my tent be at least 250 yards off the AT. Others simply view it as a place to hike the AT and never be more than an hour from a cheeseburger (summer only). Before noon we reach the Pinnacle picnic area, with a huge gazebo and picnic tables underneath, surrounding a huge stone fireplace. A roaring fire would have been peachy, but we're happy just to find a picnic table warming in the sun. We thaw our half-frozen water bottles on the table over lunch, enjoying the solitude (the wind has laid, and we haven't seen a soul the entire trip). After lunch we push up Pinnacle Mt, stopping for a few pix at a gorgeous rock outcropping before continuing uneventfully towards Mary's Rock. Here we meet our first people in the park, several of whom are climbing on the rock. During the moderate descent to the parking lot, we pass tourists in droves, including one Korean group creeping up gingerly. The upper descent is a little tricky, with ice covering much of the trail, but eventually it eases, and we're back at our car with heat on command � ahh, the joys of civilization. Is that Gorp I smell?